Melbourne is Australia’s second largest city in terms of population, but owns only one casino. In fact, it is the only casino in the entire state of Victoria. Having said that, the Crown Casino is the most renowned gambling venue in all of Australia and one of the finest casinos in the entire world. We take a look at the land-based venue, but if you can’t get to the brick and mortar casino as often as you would like you can play online from the comfort of your own home. The web casinos detailed in the table above are all secure and offer incredible promotions. The Crown Complex was originally established in 1994 and at the time, was located on the north bank of the Yarra River. But that temporary location was replaced with the current and permanent location on the south bank of the Yarra in 1997. The precinct, which includes a variety of buildings and amenities along with the casino itself, covers an area equivalent to about two city blocks. This makes Crown not only the largest casino resort in Australia, but the largest in the entire Southern Hemisphere and one of the largest in the entire world. 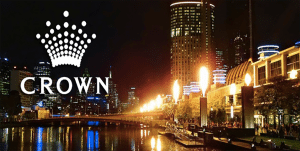 The Crown Casino offers one of the biggest selections of pokies and other electronic games in Austalia, with a total of 2500 different poker machines available to choose from on the casino floor. These offer a variety of different denominations ranging from $0.01 machines, up to the rare high limit machines in VIP areas. Just as impressive, if not more, are the table games in the casino, with over 500 available. 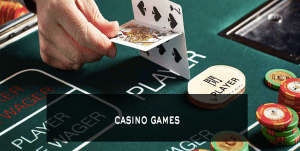 Players can choose from the six top table titles – Blackjack, Craps, Pai Gow, Poker, Baccarat and Roulette (both the standard European Roulette and the American double-zero Roulette). The double-zero games are offered on the majority of lower denomination tables. Variants are available too, but one game to avoid is Blackjack Plus which features an extremely high house edge of around 5%, compared to standard blackjack games with an advantage of around 0.5%. The Crown is one of the early innovators when it comes to blending electronic gaming with traditional table games. They were the first casino to introduce Rapid Roulette, with Rapid Baccarat and Rapid Big Wheel following suit. The games are operated by casino personnel just like a traditional game, but players can place their bets using an electronic touch screen. This design allows quick and easy access for players to place their bets, and automatically keeps track of the wins and losses of the player. This allows the game to proceed at a much faster rate. One of the greatest strengths of the Crown Casino is their poker room. Located in a separate space in Crown’s basement, you will find more than 70 tables. Most of the tables are dedicated to No-Limit Texas Hold’em, though you can also find Limit Hold’em tables and some Omaha tables too, along with 3 Card Poker on the main gaming floor. Tables run with blinds from $1/$2 to $5/$10, though larger games will also run on occasions. What the Crown poker room is really known for is the world-class and world-renowned tournaments held here. 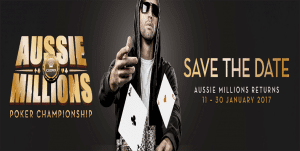 Tournaments run on a daily basis, but the Crown also plays host to some of the world’s most important poker events, including the annual Aussie Millions, currently the Southern Hemisphere’s richest poker event, and is home to the World Series of Poker Asia-Pacific (an expansion of the WSOP). Other tours like the Asia-Pacific Poker Tour and the Australia-New Zealand Poker Tour also make frequent stops at Crown. If you want to do more than gamble at the Crown, there are plenty of other amenities that can be enjoyed during a trip to the casino. Visitors are spoilt with a choice of three of the finest first-class hotels in Australia. 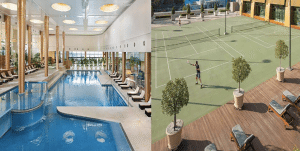 These include The Crown Towers, a five-star 481-room and 31-Villa hotel; The Crown Metropol, Australia’s largest five-star hotel by number of rooms, housing 658 rooms across 28 floors; and The Crown Promenade – more corporate hotel with 465 rooms across 23 floors. For shopping options, there are dozens of diverse luxury stores, including Burberry, Hugo Boss, Prada and G-Star Raw. Fine dining can be found throughout the complex, with 15 premium restaurants which include all styles of food from around the world ranging from the Italian Rosetta Ristorante, to the Japanese Nobu. For a more casual experience, you can visit one of the many Cafés or buffets, including the famous Kitchen Workshop, an interactive buffet where you can see food being made directly in front of you. There’s no shortage of entertainment in the Crown complex, either. Along with a full selection of bars and nightclubs including the exclusive Club 23, visitors can enjoy watching a movie at the Village Cinemas, test their skills at Kingpin Bowling, or head down to the arcade and laser-tag area; Galactic Circus. The Palladium Room, one of Melbourne’s most outstanding ballrooms, has a seating capacity of 1500 and has hosted some of Australia’s richest events and functions. The Palms, an up-scale theatre that seats up to 800 people, hosts world famous comedians, musicians and touring musicals. If you’re located in NSW check out the Star Casino or what’s on offer in QLD. If you are a Victorian wondering which online casinos are allowed in VIC, you’ll be happy to know there are plenty of options available for that alternative, too. For online play, we recommend Raging Bull Casino as the top-rated casino site for players from United States, which has some excellent welcome bonuses available for new players.